If you're just getting this blog post, there's been some bugs in the system and there was a computer virus I've been tackling. I had to learn how to code in order to get this back online, but excited to say it's working! 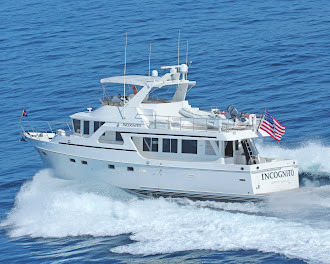 There are a few previous blog posts that are up on the website, so feel free to go to www.incognitoboat.com to view those. This post is about 2 months old, but as the saying goes..better late than never! Pronounced Dom-é-nee-ka. Home to 8 potentially live volcanos. Their 300" ) of annual rainfall (That's ALOT of rain!!) in the center of the island is something you can only experience. It's wet! The rainforests and terrain are absolutely spectacular. Dominica is an island country in the Lesser Antilles region of the Caribbean Sea, south-southeast of Guadeloupe and northwest of Martinique. Its area is 750 square kilometres (290 sq mi) and the highest point is Morne Diablotins, at 1,447 metres (4,747 ft) elevation. The population was 72,301 at the 2014 census. The capital is Roseau (cruise ship central! ), located on the leeward side of the island. The island was originally inhabited by the Kalinago/Arawak and later colonised by the Europeans, predominately by the French, who arrived at the island on Sunday, 3 November 1493 ("Sunday" = "Domenica" in Italian). Great Britain took it over in 1763 after the Seven Years' War and gradually established English as the official language. The island republic gained independence in 1978. Its name is pronounced with emphasis on the third syllable, related to its former Dominique. Dominica has been nicknamed the "Nature Isle of the Caribbean" for its unspoiled natural beauty. It is the youngest island in the Lesser Antilles, still being formed by geothermal-volcanic activity, as evidenced by the world's second-largest hot spring, Boiling Lake. The island has lush mountainous rainforests, and is the home of many rare plants, animals, and bird species. There are xeric areas in some of the western coastal regions, but heavy rainfall occurs inland. The Sisserou parrot (also known as the imperial amazon), is found only on Dominica and is the island's national bird and featured on the national flag. 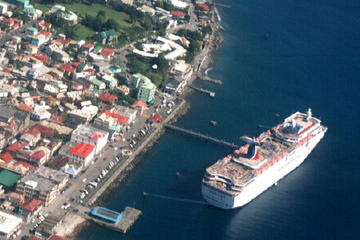 Dominica's economy depends on tourism and agriculture. We arrived here after a two hour cruise from Îlle des Saintes. I was happy to get there and see what this island had to offer. We will be back to English speakers only as the last island only spoke French. Phew. Absolutely lush and tropical as can be. We were previously warned that there were fishing boats that would rush out to greet us and try to get some business from us. The people here are very poor, yet extremely proud and it's important to treat them with the utmost respect. They are hard workers and aren't the type asking for handouts. However, some are very aggressive and really give you the once over. They can be nasty if you don't imbibe, curse at you and not leave you alone until you agree to buy something. with one quasi-oar as he sat atop an old beat up surfboard. Such a humbling experience. We happily gave him a bag of trash and a nice tip. had another guy reserved. Then, our "facilitator"
that Brad previously booked showed up and was named Jeff Frank. (Could be an alias? ha!) We met and he guided us to the anchorage. He was sweet as sugar. He told us that he could take us on a tour of the Indian River and we booked that with him too. It turns out that these "boat boys" created their own cabana boy union of sorts. Everyone respectfully takes care of each other and they watch each other's back. into customs and make us official in this country. We later went to shore that afternoon when Jeff picked us up in his wooden boat. He was going to take us on a tour of the infamous Indian River. 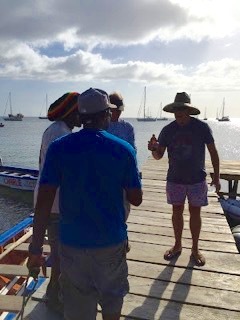 We of course had to make a stop at another boat to pick up some Italians from Rome heading to shore, so I was able to use my Italiano and enjoyed a quick convo with them as we cruised the sea in our boat taxi. As we docked, some Rasta guy with a lit joint in his mouth came out and handed us all a cold Red Stripe beer. What a crack up! The photo doesn't do that moment justice. I was at the wrong angle and didn't want to be a spazz taking a photo of the guy smoking his shoobie-doobie. We walked around a bit and checked out the local housing market. It was interesting and another humbling experience. I'm not quite sure how to even explain this boat of a treehouse, so take a look for yourself. Bish chatted the owner up and he was really nice. He was beyond proud of his creation and was still busy building it year by year. What an interesting sight... not sure if he used nails or if it was all hand tied. Too bad Big Papa's didn't last... the name alone should have gone the distance. This side of the island was a few hours north of the capital city of Rosseau. It was much more tranquil here and surrounded by natures bounty. I went native with the locals...it was so hot & insanely humid that day I felt like I was melting. This was the piece d' resistance that Bish surprised us with while we went on a walk. He scrawled it on the side of a local restaurant where they encourage graffiti. "Incog-knee-toe" baby! Jeff then took us to the mouth of the Indian River. I was SO excited to see this part of the island. one of these kiosks at the mouth of the river before we headed upstream. As soon as we got there, he cut off his engine and all was quiet. AH..so happy! It was SO peaceful and I couldn't drink in all that beauty fast enough. The river is a protected area and they want to keep the water clean, hence no engines. Jeff whipped out his oars and rowed the mile tour. Impressive. Yipee...I was psyched for this nature adventure! oars treading water and hundreds & hundreds of birds chirping. Disneyland and was awaiting a croc to jump out at us. This was a surreal experience. Most of these trees are called Bloodwoods. They procreate and grow like crazy, then they cling onto other unsuspecting breeds and end up killing those trees that are native like hibiscus, coconut and oodles of ferns. Jeff said that the waterway had to be cleared once a week to keep it up. How amazing is that? They were a spectacular sight & the root systems were insane! I think we were a little crazy from the heat and ready to cool off on this jungle cruise. We had fun dorking it out. hut doing here and who lives here? Honey, are we moving? Turns out this hut was built for the set of Pirates of the Caribbean, Dead Mans Chest. It wasTia Dalma's house. They kept it all intact and it surely generated more interest in this part of the island. This section of the river used to be a Carib Indian settlement, and actually it was only recently wiped out by a hurricane a few years back. The Indians now live in the Kalinago settlement on the winward side of the island. We then pulled up to a dock not too far from the Pirate hut..turns out that it was a bar! Wha? We are miles from nowhere. doing his signature "peace & love" fist bump. He was the sweetest namaste guy. You gotta love a bar found deep in the bush of the Indian River. This was a RIOT! We were in the middle of nowhere and their bar was obvi custom tailored to the adventure seeking crazies like us. A little seating carved out of the local jungle. Now that's eco-friendly! Our friendly bartender who could make a mean rum punch. Stranger danger! Buddha made me a little origami cricket out of a palm frond. Super sweet! Little did they know we were right on their tail. In my opinion, the Indian River is the main reason to visit Dominica. If you head out at the crack of down, you'd get to see hundreds of the indigenous parrots. Sadly we missed them as we opted for the afternoon due to our travel schedule. before I was infected with a Zika mosquito. AACK! but they then caught up & had fun racing us a little later. Ah sunset...my fave time of day! Oh yes, my dance machine was out in all his awesome glory that night. so we opted to eat aboard and Bish cooked up one of his amazing vegan specialties. and even a small poisonous sea snake. an awesome light show under the night sky. We had never seen one up close light-up like this. I can't imagine what that stinger feels like! My fave photo from our day!